The Light Between Oceans is a deep, thoughtful story about love and life and the choices we make and the consequences with which we have to live. 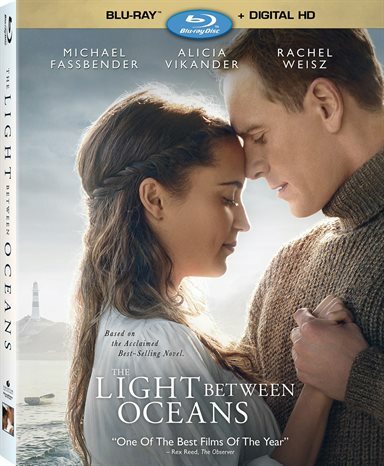 The Light Between Oceans is a romantic drama based upon the 2012 novel of the same name by M.L. Stedman. Distributed by Walt Disney Studios Motion Pictures, Dreamworks Pictures takes on a deep topic to bring to the big screen. Done with grace and dignity, The Light Between Oceans is a wonderful, but bittersweet story about love, life, and the lessons learned through both. The Light Between Oceans is set in post World War One in Australia. Janus is the island that houses the lighthouse, of which Tom Sherbourne (Michael Fassbender; X-Men Apocalypse) is the keeper. He meets and falls in love with Isabel Graysmark (Alicia Vikander; Jason Bourne) and takes her to the island. There, she suffers two stillbirths and when a small rowing boat ends up on their island with a dead man and a small crying baby, Isabel begs her husband not to report the finding so they can have a family. No one is the wiser until Sherbourne realizes to whom the baby belongs to and his conscience gets the best of him. The story surrounding the couple and their trials and tribulations for love and family is remarkably touching and heart-wrenching. Michael Fassbender's performance as Tom Sherbourne is deep. The conflict that Sherbourne struggles with for most of the film is etched on Fassbender's face. The love he has for Isabel is worn on his sleeve. The emotion Fassbender presents as Sherbourne captivates you and makes you feel the love this man has for his wife and you understand why her does what he does for love. Fassbender brings out both the best and worst qualities of Sherbourne's character with ease and familiarity that Sherbourne becomes the man you care about. Alicia Vikander is Isabel Graysmark, the young woman who marries Sherbourne and follows him to his island with the Janus lighthouse. Isolated but happy with her life, Vikander's heartbreaking performance of a woman going through the emotional battle over losing two babies is nothing if not gut-wrenching to watch. Not only does Vikander make you care about Isabel, she invokes sympathy and agreement with most of her choices, even when they are wrong. Director and Screenwriter Derek Cianfrance (Blue Valentine) created a quiet storyline with a huge plot. The beginning of the film was equally as slow to its counterpart novel, but like the novel, it soon picked up the pace and kept your attention. Regardless, there were parts of the storyline that, while interesting, just slowed down the interest in the plot. The foreshadowing of the story was well placed and enhanced the storyline and movie. Cianfrance did a very good job maintaining the integrity of M.L. Stedman's original story. The Blu-ray is presented in 1080p High Definition Widescreen with an aspect ratio of 2.40:1. The colors were soft when the story was soft and sweet and when something impactful was happening; the camera seemed to focus on red and blue doors and window frames. It was a quiet and gentle type of cinematography, perfectly fitting this type of story. The audio was presented in English 7.1 DTS-HDMA. The background music was calming throughout the film, creating a feeling as if you were just slowly moving through life or basking in the sunlight. Even in the saddest parts of the film, the lulling music could be heard supporting the actual dialogue without overpowering or detracting from the emotion so clearly heard in the actors' voices. Overall, the audio complemented the film and really enhanced the storyline in a way not often seen in an era of big booming music. Bonus Features are always a positive quality in the purchase of a Blu-ray and Dreamworks did not skimp on these features. Bringing the Light to Life (16:48): Live from New Zealand, where filming occurred, spend time with the actors and find out who Director Cianfrance's style impacted their performance. Audio Commentary (2:12:51): Director Cianfrance and his film studies professor, Phil Solomon, take you through the film and give insight as to why things were done, how, and what the feeling is at the time of a scene. Lighthouse Keeper (5:32): A history lesson of the Cape Campbell Lighthouse and what it was like to be a light keeper in a time that only exists in the past. Overall, The Light Between Oceans is a deep, thoughtful story about love and life and the choices we make and the consequences with which we have to live. It is a story about surviving the most horrible events and having faith in other people. It is a story about selfishness and forgiveness, at the same time. While slow in parts, The Light Between Oceans is still a romantic movie that after watching, you will hug your partner and hug your children. Download The Light Between Oceans from the iTunes Store in Digial HD. For more information about The Light Between Oceans visit the FlickDirect Movie Database.